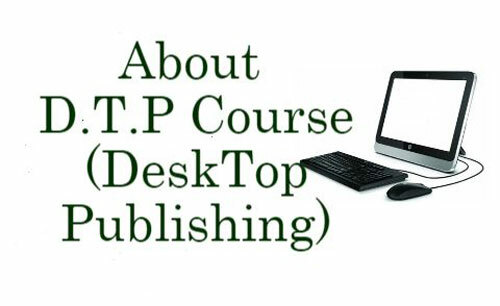 The full form of D.T.P is Desk Top Publishing. D T P Course refers to the design and production of publications using personal computers with graphics capability. Desktop publishing is the creation of document using page layout skills on a Computer system. Below we have provided complete info about D.T.P Course – Full Form, Fee, Duration, Requirements, DTP Training Institutes, etc. The D T P Program is focusing on the various designing techniques and effects for the printing industry. Candidates who complete this course can start their own designing firm catering to project works such as Brochure Designing, Visiting Cards, Banners, Flyers, Magazines and Newsletters etc. Individuals also has an option to appear for Government recognized examination. Course Duration is One year. Candidate require a high school diploma or General Education Development (GED) equivalent for admission. Applicants may have to pass a computer proficiency exam or a basic computing class prior to enrollment. Desk Top Publishing operators are in great demand. Companies specializing in advertising, visualization, publishing and designing are constantly hiring DTP operators. Various private and public organizations also need Desktop Publishing operators for their designing, publishing and documentation needs.